Southern Splendor awaits in Seaside, Florida! 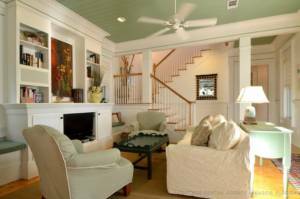 This 4 bedroom/ 3 bath luxury vacation rental easily sleeps 10 guests and offers all of the comforts and conveniences of your very own home. Gathering spaces include a fully-equipped kitchen with a gas stove complete with bar seating. 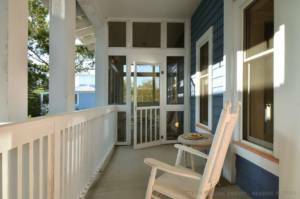 A living and dining area as well as a screened in porch and open porches offer plenty of room for everyone to sit back and relax. The master bedroom located on the second floor features a private bath with a Jacuzzi tub and access to a private screened-in balcony porch. Also, on the second floor, a Queen bedroom with a Clawfoot tub in the hall bathroom, a quaint sitting area with a TV is located at the top of the stairs and small alcove across from the sitting area houses a set of twin beds which is perfect for kids. A tower room sits on the third floor with a Queen bed and small balcony offering amazing views of Seaside and a slight view of the Gulf. 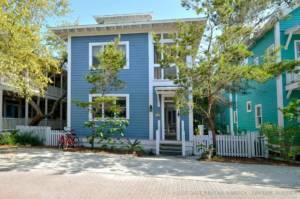 Click HERE for availability and more information about this beautiful vacation rental.